Hooray! We're celebrating our second birthday this week! We did actually get out the cake tins and make our own buns but they didn't look remotely as good as this. Thankfully our online marketing is better than our baking! 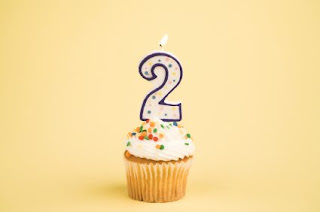 It has been a fantastic two years for Engage MC! We've met some amazing people along the way. We're still working regularly with our very first clients (and very happy to do so) and look forward to developing equally strong relationships with our new clients. We've continued to grow personally and professionally too, working towards Chartered Marketer Status with the Chartered Institute of Marketing and undertaking Google Adword Professional exams. But perhaps the most satisfying thing has been seeing the online marketing methods we believe so passionately in, working so well for our clients. Their websites are appearing in the first page of search engine results, they're getting more leads and making sales. They're taking control of their online presence and engaging their customers in conversation. They're delighted and so are we. Congratulations, Madeleine. Many happy returns!! Thanks Dawn! I'm looking forward to a busy third 3rd year! Retailers put Coleraine on the map!